In 1912, Leon Leonwood Bean opened a store in the basement of his brother's apparel shop at Freeport Corner, selling the "Bean Boot" (or Maine Hunting Shoe). This store, L. L. Bean, became so popular that in 1951 it started remaining open 24 hours a day. Its retail and mail order catalog facilities expanded into Freeport's principal business, and a worldwide company with annual sales of over a billion dollars. In 1982, McDonald's made plans to tear down an 1850s Greek Revival house to build one of its standard stores. Outcry from residents caused the town to adopt new ordinances concerning what businesses could and couldn't do with their buildings, and McDonald's built the restaurant inside the house, maintaining the exterior appearance. This was one of the first times that McDonald's had been forced to change its restaurant design to fit local requirements. According to the United States Census Bureau, the town has a total area of 46.47 square miles (120.36 km2), of which, 34.70 square miles (89.87 km2) of it is land and 11.77 square miles (30.48 km2) is water. Situated at the northeastern extremity of Casco Bay, Freeport is drained by the Harraseeket River. Freeport borders Brunswick and Durham to the north, Pownal to the west, and Yarmouth to the southwest. 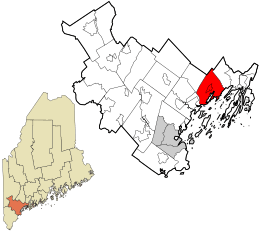 Freeport also shares small borders with Cumberland and Harpswell in Casco Bay. 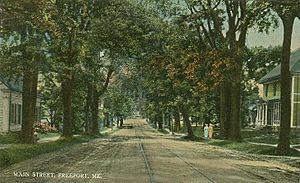 Cumberland and Harpswell are not connected to Freeport by roads, but since Freeport's town border ranges out into Casco Bay, the other towns' borders meet Freeport's. This climatic region is typified by large seasonal temperature differences, with warm to hot (and often humid) summers and cold (sometimes severely cold) winters. According to the Köppen Climate Classification system, Freeport has a humid continental climate, abbreviated "Dfb" on climate maps. Both U.S. 1 and Interstate-295 run directly through Freeport, the latter with three and a half exits. Amtrak's Downeaster train service stops at Freeport station with service to the Portland Transportation Center and Boston's North Station. As of the census of 2010, there were 7,879 people, 3,209 households, and 2,173 families residing in the town. The population density was 227.1 inhabitants per square mile (87.7/km2). There were 3,690 housing units at an average density of 106.3 per square mile (41.0/km2). 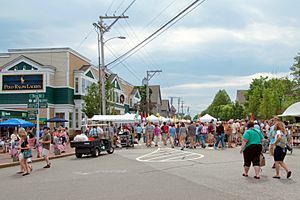 The racial makeup of the town was 95.2% White, 0.6% African American, 0.4% Native American, 2.3% Asian, 0.2% from other races, and 1.4% from two or more races. Hispanic or Latino of any race were 1.1% of the population. There were 3,209 households of which 32.6% had children under the age of 18 living with them, 55.8% were married couples living together, 8.2% had a female householder with no husband present, 3.7% had a male householder with no wife present, and 32.3% were non-families. 25.1% of all households were made up of individuals and 10% had someone living alone who was 65 years of age or older. The average household size was 2.40 and the average family size was 2.89. The median age in the town was 45 years. 22.8% of residents were under the age of 18; 5.3% were between the ages of 18 and 24; 22% were from 25 to 44; 34.7% were from 45 to 64; and 15.3% were 65 years of age or older. The gender makeup of the town was 47.4% male and 52.6% female. As of the census of 2000, there were 7,800 people, 3,065 households, and 2,151 families residing in the town. The population density was 224.8 people per square mile (86.8/km²). There were 3,276 housing units at an average density of 94.4 per square mile (36.4/km²). 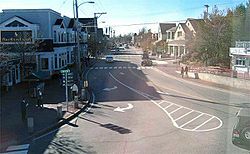 The racial makeup of the town was 97.22% White, 0.42% Black or African American, 0.31% Native American, 1.04% Asian, 0.04% Pacific Islander, 0.33% from other races, and 0.64% from two or more races. Hispanic or Latino of any race were 0.74% of the population. There were 3,065 households out of which 34.7% had children under the age of 18 living with them, 57.5% were married couples living together, 9.5% had a female householder with no husband present, and 29.8% were non-families. 22.4% of all households were made up of individuals and 7.4% had someone living alone who was 65 years of age or older. The average household size was 2.49 and the average family size was 2.93. In the town, the population was spread out with 25.2% under the age of 18, 5.0% from 18 to 24, 29.4% from 25 to 44, 27.6% from 45 to 64, and 12.7% who were 65 years of age or older. The median age was 40 years. For every 100 females there were 94.5 males. For every 100 females age 18 and over, there were 89.9 males. The median income for a household in the town was $52,023, and the median income for a family was $58,134. Males had a median income of $41,703 versus $27,490 for females. The per capita income for the town was $27,724. About 4.0% of families and 5.9% of the population were below the poverty line, including 7.0% of those under age 18 and 10.4% of those age 65 or over. Freeport, Maine Facts for Kids. Kiddle Encyclopedia.